Deep inside Missouri’s only nuclear energy center, you can actually feel power being generated. Steam pulses through the plant’s giant turbine column—spinning at 1,800 rotations per minute, causing a deafening hum and a slight, but palpable, vibration. 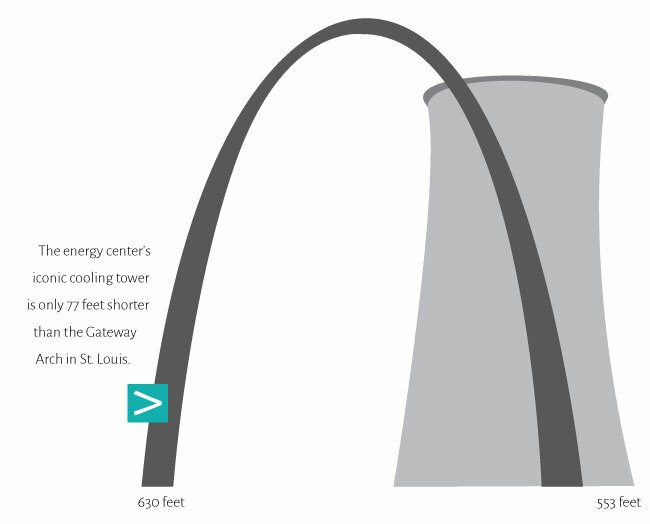 The energy center’s cooling tower is only 77 feet shorter than the Gateway Arch in St. Louis. Everything feels oversized at the Ameren Missouri-owned plant. Visible from miles away, the facility towers over 7,200 acres of rolling, wooded conservation land in rural Callaway County. The plant’s second largest structure is the dome-topped reactor containment building, where controlled nuclear fission creates enough heat to turn 15,000 gallons of river water into steam each minute. That steam eventually evaporates out of the top of the energy center’s iconic cooling tower, which is a mere 77 feet shorter than the Gateway Arch in St. Louis. The enormity of the Callaway Nuclear Energy Center is appropriate given its importance to Missouri’s power supply. The plant’s annual 8.4 million megawatt-hours of energy account for roughly 20 percent of Ameren Missouri’s total production—enough for about 750,000 homes. The importance of the Callaway nuclear plant is likely to continue to grow. “As our coal plants age and with the new EPA rules, obviously nuclear is going to be more in the limelight,” Cox says. The nuclear reactor in Callaway County is a powerful economic engine for central Missouri. The plant employs approximately 800 people. Every 18 months, the workforce more than doubles as power-generation pauses for refueling. During this time, more than 1,100 contract workers assist in the refueling process and perform maintenance work and repairs. 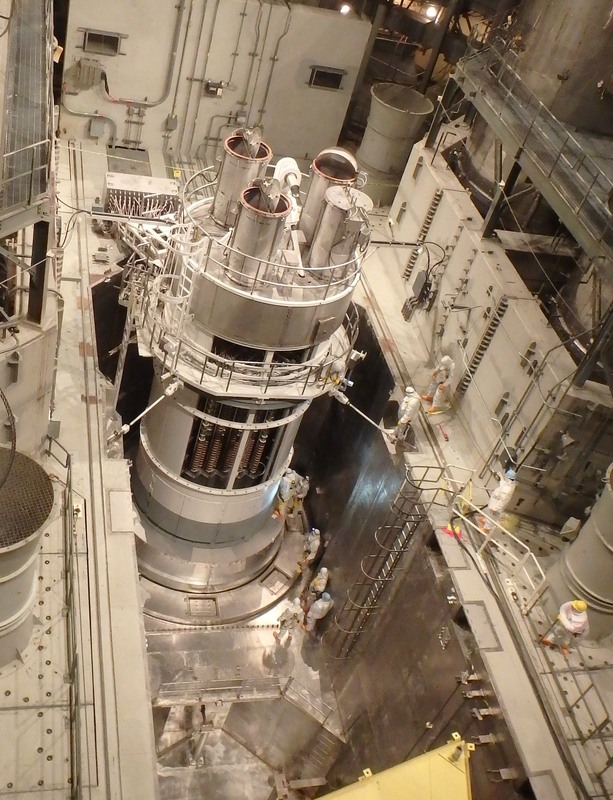 During the most recent refueling outage in late 2014, workers installed a new $150 million reactor vessel head—a five-year effort. The energy center is a major tax revenue generator for local governments. The plant pays approximately $10 million annually in Callaway County, including about $7 million to local schools. The transmission lines leading from Callaway also generate about $23.5 million in tax payments to 66 other Missouri counties. The facility is currently licensed by the government to operate for 40 years, until 2024. Ameren Missouri has already completed the multi-year process of applying for a 20-year license renewal, which would allow operation until 2044. In February, the staff at the Nuclear Regulatory Commission recommended in favor of the renewal. The final step is an approval vote by the commissioners. That withstanding, Cox says the Callaway energy center is likely not even halfway through its lifespan. The facility’s nuclear reactor vessel was designed to last 80 years. “We may have to do modifications or replacements along the way, but our long-term strategy is to not only operate to 60 years, but to 80 years,” Cox says. Despite the massive size of the Callaway Nuclear Energy Center, its power actually comes from something smaller than your pinky finger. The nuclear reaction at Callaway is fueled by tiny, cylinder-shaped uranium pellets. Each pellet is roughly as tall as a dime standing on edge. The intense energy in the uranium pellets is released as heat during a fission reaction. 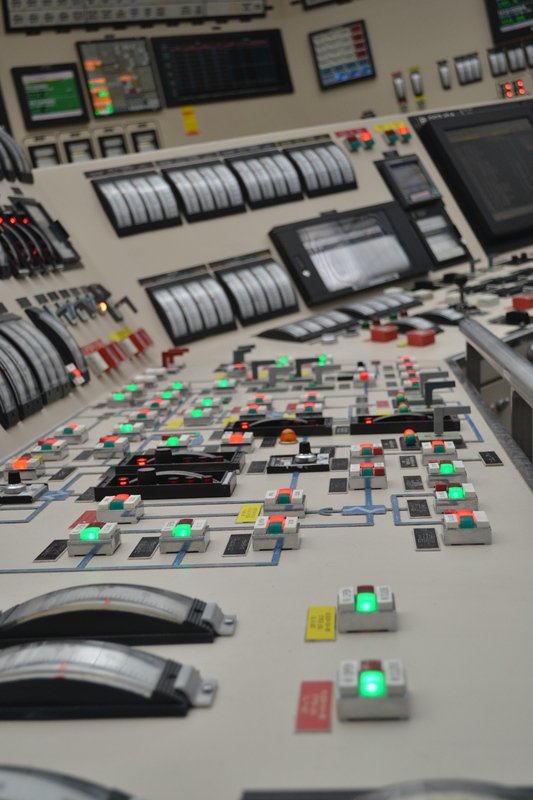 Controlling this process is a small team of nuclear operators who work 24/7 in the plant’s NASA-like control room. To an outsider, the control room appears incredibly complex, with its mystifying assortment of lights, levers, buttons, and monitors. Fortunately, the people at the controls have years of training and experience. This includes enduring worst-case scenarios at a simulated control room located just across the parking lot from the real reactor. While the job carries a huge responsibility, Ameren works to hire plenty of smart people to keep the plant running. Fortunately, the company has considerable help finding the right workforce. Both the Missouri University of Science and Technology in Rolla and the University of Missouri in Columbia have nuclear engineering programs that supply a talent pool to the Callaway facility and beyond. Both Missouri S&T and the University of Missouri have research reactors used for training and research. The 10 megawatt nuclear reactor in Columbia is the nation’s most powerful university-based research reactor. “We are rapidly growing in student size,” says Dr. Hyoung-Koo Lee, chair of mining and nuclear engineering at Missouri S&T. The university’s nuclear engineering program currently has 250 students enrolled, a 45 percent increase over the past four years. The university hosts a nuclear engineering summer camp each year to attract students to the field and works with the Nuclear Regulatory Commission to offer scholarships and fellowships. As they design their courses, Missouri S&T faculty listen to industry and peer input from the university’s Nuclear Engineering Development Board. “We teach the whole spectrum of nuclear engineering that is essential to work at a nuclear power plant after graduation,” Lee says. Ameren appreciates having the ability to hire home-grown talent. “They are a great fit because they are from here,” Cox says. The basic process for producing nuclear energy hasn’t changed in decades. However, the industry and market for nuclear power is evolving rapidly. Much like the Callaway Energy Center, half of all nuclear plants in the United States are more than 30 years old. Most of the rest are at least 20. Recent decades have seen very little interest in new nuclear plant construction, but that is beginning to change. “All the major forecasts point to a major expansion in nuclear energy around the world over the next 20 years,” says Marvin Fertel, the president and chief executive officer at the Nuclear Energy Institute in Washington, DC. According to the Nuclear Regulatory Commission, five nuclear reactors are under construction in the United States, with 10 reactors in active licensing. Fertel pointed to the government’s desire to further regulate carbon-emitting coal power plants as one reason for potential nuclear power expansion. Coal plants currently supply approximately 40 percent of the nation’s energy and more than 80 percent in Missouri, according to the US Energy Information Administration. If the effort to reduce the reliance on coal is successful, the extra capacity must come from somewhere. Fertel, Cox, and others argue that nuclear energy, while not renewable, should be considered a green energy source for the country’s future. Fertel also thinks that last year’s winter weather patterns have made the case that nuclear should become a bigger piece of the nation’s energy mix. A number of coal and natural-gas plants were forced out of service during periods of extreme cold in 2014, Fertel says. Coal plants had to deal with frozen equipment and delayed coal shipments. The demand for natural gas during the cold spells left some plants unable to purchase enough fuel to operate. As for Missouri, Ameren filed an application in 2008 to add a second reactor at the Callaway plant. A rendering filed with the Nuclear Regulatory Commission shows an expanded plant with two reactors and three cooling towers. However, Ameren suspended the application in 2009 as it faced funding challenges on the at least $6 billion expansion. Should the need arise, and funding arrive, Ameren’s application for Callaway Unit 2 could someday be revived. It would be very beneficial for Ameren to build a second plant in Missouri. Clean Energy, Job creation, the Economic benefits alone. I’m at V.C. Summer now and to see the economic growth around here is crazy. I’m from Boonville and would love to see Ameren build a second reactor.